BRISTOL- Once again, the Bristol Blues used a single inning to their advantage. 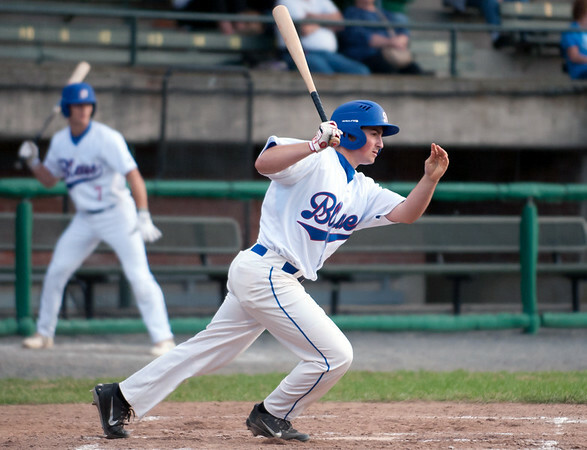 After struggling early on, the Blue came through in the sixth with a four-run inning to beat the Worcester Bravehearts Tuesday at Muzzy Field. Theodore Hague and Miguel De Los Santos hit back-to-back doubles to drive in the first three runs of the inning, while Ian Ostberg capped off the bottom of the frame with an RBI single. Bristol had a stretch of six consecutive baserunners in the inning to pull ahead after the Bravehearts had scored three runs in the top of the second on a pair of doubles by Alex Gionis and John Thrasher. Bristol scored its only other run in the first without needing a hit. Ostberg walked and stole second to start the game. Groundouts by Richard Brereton and Matthew Bonvicini moved Ostberg around to score. Bonvicini got the Blues’ first hit of the night on a sharp single to right center in the bottom of the fourth. The Blues had load the bases in the inning with one out, but were unable to move any more runners in. Jason Hebner got the start on the mound for the Blues and struggled with his command. He gave up four hits and had four walks in five innings of work. Hebner also had two hit-by-pitches to go along with the walks. He gave up three runs, but only one was earned, with the defense making four errors behind him and misplaying several popups and flyouts. Hebner had to work in and out of trouble throughout his start. Worcester had at least one runner on base in every inning Hebner was on the mound and was able to move a runner in scoring position in every inning except the first. But overall, the lefty has given up just one earned run in 10 innings on the mound this season. The win moves Bristol to 9-3 on the season. The Blues conclude their three-game home stand Wednesday night against the first-place Martha’s Vineyard Sharks. Posted in Newington Town Crier, Bristol Blues on Tuesday, 12 June 2018 22:46. Updated: Tuesday, 12 June 2018 22:48.